Get some cultural insight at Vatican Museums and Galleria Borghese. Sistine Chapel and Museo Nazionale di Castel Sant'Angelo will appeal to museum buffs. The adventure continues: make a trip to St. Peter's Basilica, get to know the fascinating history of Piazza Navona, explore the world behind art at Musei Capitolini, and pause for some serene contemplation at Church of St. Louis of the French. To see more things to do, where to stay, other places to visit, and more tourist information, you can read our Rome online journey planner . Washington DC, USA to Rome is an approximately 13-hour combination of subway, bus, and flight. You can also do a combination of train and flight; or do a combination of subway, bus, flight, and train. You'll lose 6 hours traveling from Washington DC to Rome due to the time zone difference. April in Rome sees daily highs of 69°F and lows of 49°F at night. Finish up your sightseeing early on the 14th (Sat) so you can catch the train to Florence. Let the collections at Galleria dell'Accademia and Pitti Palace capture your imagination. Do some cultural sightseeing at Cathedral of Santa Maria del Fiore and Ponte Vecchio. The adventure continues: admire the masterpieces at Uffizi Galleries, get a sense of history and politics at Palazzo Vecchio, get to know the fascinating history of Piazza della Signoria, and take some stellar pictures from Piazzale Michelangelo. For where to stay, maps, and tourist information, go to the Florence tour itinerary builder tool . Traveling by train from Rome to Florence takes 1.5 hours. Alternatively, you can drive; or fly. In April, daily temperatures in Florence can reach 67°F, while at night they dip to 50°F. Wrap up your sightseeing on the 18th (Wed) early enough to take a train to Venice. Let the collections at Doge's Palace and Museo Ebraico di Venezia capture your imagination. Your cultural itinerary includes sights like Basilica di San Marco and Ca' Rezzonico. There's still lots to do: appreciate the extensive heritage of St. Mark's Square, explore the world behind art at Museo Correr, enjoy breathtaking views from St Mark's Campanile, and pause for some serene contemplation at San Giorgio Maggiore. For reviews, where to stay, more things to do, and other tourist information, read Venice online holiday planner . You can take a train from Florence to Venice in 2.5 hours. Alternatively, you can drive; or take a bus. April in Venice sees daily highs of 65°F and lows of 49°F at night. On the 21st (Sat), wrap the sightseeing up by early afternoon so you can travel to Berlin. You'll explore and learn at Pergamon Museum and Jewish Museum Berlin. Satisfy your inner culture vulture at Topography of Terror and Charlottenburg Palace. The adventure continues: pause for some photo ops at Brandenburg Gate, see the interesting displays at Neues Museum, steep yourself in history at Mauermuseum - Museum Haus am Checkpoint Charlie, and stroll through Zoo Berlin. To see traveler tips, other places to visit, reviews, and tourist information, you can read our Berlin day trip planner . You can fly from Venice to Berlin in 5 hours. Other options are to drive; or take a train. Cap off your sightseeing on the 26th (Thu) early enough to travel to Munich. Appreciate the collections at Nymphenburg Palace and Alte Pinakothek. Get some cultural insight at Deutsches Museum and St. Peter's Church. And it doesn't end there: explore the world behind art at New Pinakothek, see the interesting displays at Munich Residenz, make a trip to Marienplatz, and take in panoramic vistas at Frauenkirche. To find maps, other places to visit, traveler tips, and tourist information, read our Munich itinerary maker website . Traveling by flight from Berlin to Munich takes 3.5 hours. Alternatively, you can take a train; or drive. In April in Munich, expect temperatures between 57°F during the day and 37°F at night. Finish your sightseeing early on the 29th (Sun) to allow enough time to travel to New Delhi. Kick off your visit on the 30th (Mon): contemplate the long history of Gurudwara Bangla Sahib, admire the landmark architecture of Lodi Gardens, then admire the landmark architecture of Humayun's Tomb, and finally contemplate the long history of India Gate. On the 1st (Tue), you'll have a packed day of sightseeing: don't miss a visit to Red Fort (Lal Quila). 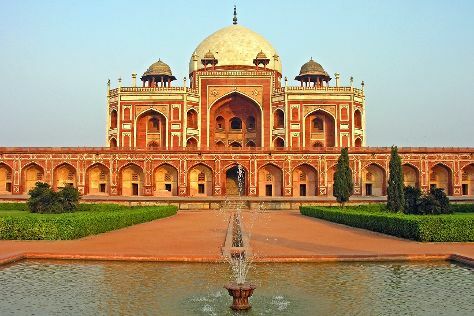 To find ratings, more things to do, traveler tips, and other tourist information, go to the New Delhi trip itinerary planner. Traveling by flight from Munich to New Delhi takes 10.5 hours. Traveling from Munich to New Delhi, you'll lose 4 hours due to the time zone difference. Plan for much warmer temperatures traveling from Munich in April, with highs in New Delhi at 98°F and lows at 71°F. Wrap up your sightseeing by early afternoon on the 1st (Tue) to allow enough time to travel back home.